Valentine’s Day is one of those holidays I’ve never really taken seriously, good for Hallmark and florists but a bit too fluffy for me. I’ve never expected a bouquet of red roses, in fact it almost seems too cliché to mean anything. (I just told Joe I was writing on the topic. His response: ‘Uh oh. What are we doing for it?’) If there’s one thing, though, that Valentine’s Day is good for it’s an excuse to eat chocolate. In addition to being delicious, chocolate has a long list of health benefits, including lowering cholesterol and slowing the aging process with its antioxidants. I learned a lot the year I lived in Italy, including how to bake and enjoy biscotti. Italians dip them in a dessert wine called vin santo after dinner, but I love to dunk them in my morning cup of coffee. 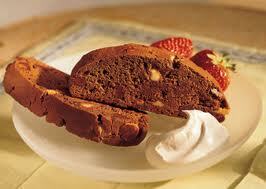 So ditch the overpriced roses and bake your sweetie some of these triple chocolate biscotti this Tuesday. If you’re too busy to cook, there’s always the store-bought option. San Franciscan Italians brought biscotti to North Beach and have been baking them here for generations. My friend Steve Siranni, with whom I spent many a fun time in high school, took his grandmother’s biscotti recipe from Lucca, Italy and started Nonni’s Biscotti shortly after he graduated from college. The company has been a huge success and you can now find them at grocery stores everywhere, including Costco. So whether or not you want to bake your own or pick up a jar of Nonni’s at your local grocer, get heart healthy and celebrate this Valentine’s Day with some chocolate biscotti. Line large baking sheet with double thickness of foil. Sift flour, cocoa, baking powder and salt into medium bowl. Using electirc mixer, beat sugar and butter in large bowl to blend, Beat in eggs, one at a time, then vanilla. Beat in flour mixture. Stir in semi-sweet and white chips. Drop dough by heaping tablespoonfuls onto prepared baking sheets in two 10-to-11 inch long strips, spacing 3 inches apart. Using metal spatula or wet fingertips, shape strips into 11-by 2 1/2 inch logs. Refrigerate 30 minutes. Preheat oven to 350 degrees F. Bake logs until tops are cracked and dry and tester inserted into center comes out clean, about 25 minutes; cool 10 minutes. Reduce oven temperature to 300 degrees F. Using foil as aid, lift logs onto work surface. Line baking sheets with clean foil. Using serrated knife, gently cut warm logs crosswise into 3/4 -inch thick slices. Arrange half of slices, cut side down, on each prepared baking sheet. Bake biscotti until just dry to touch, about 8 minutes. Cool on sheets and enjoy with coffee or dessert wine, and your sweetie, of course!